Black Swan on the Horizon: Will the Stock Market Crash Soon? The eerie calm that has prevailed on Wall Street in recent weeks is about to break into a storm. News from Washington appears to have undermined President Donald Trump’s credibility. 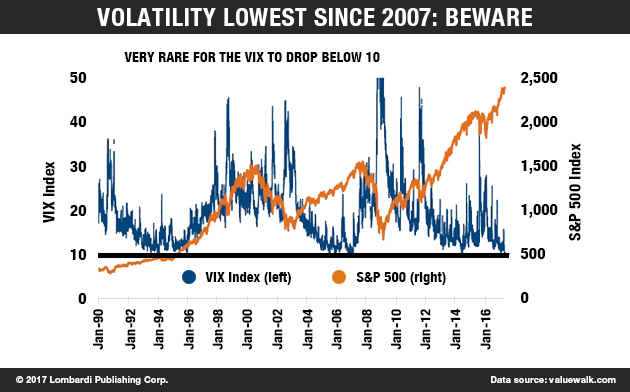 As usual, the Volatility Index (VIX) has deceived investors. Having dropped to its lowest level in months after Emmanuel Macron won the French elections, actual volatility on the exchange floor has gone way up. The stock market predictions for 2017 have radically changed. While many had already noted that the market was way too optimistic, the markets kept up the pretense of “good times ahead.” But as always, there’s some event buried in the background that eventually manifests itself as a major risk factor. Unfortunately, such events can only be caught and understood after the fact. They are the so-called black swans, as author Nicholas Nassim Taleb has identified them. The first black swan of 2017 has finally been identified. History might eventually recognize President Trump’s firing of FBI Chief James Comey as that event. Others might see it as Trump’s alleged sharing of intelligence with Russia’s foreign affairs minister Sergey Lavrov at the White House. Without going into details, the two events are related. As far as the markets are concerned, Trump’s intelligence “leak”—apparently, a warning that ISIS might be planning to attack civilian airliners—is the true black swan. This is the event that has altered the stock market forecast for the next three months—or for the rest of the year. A one-sentence summary points to the following situation: The United States political leadership is teetering and the allegedly low volatility will sooner, rather than later, catch up to reality on Wall Street. The crash will be all the harder. The stock market bubble that has inflated because of Trump’s economic policies has become untenable, given that Trump’s ability to last his full mandate has come into question. Understand, this is an analysis. It does not represent what I may or may not think about Trump. Trump won the election. Not a minute afterwards, the entire “liberal” (never was a word more regrettably used to describe people who claim to be as such) “globalist” machine was set in motion to attack and overthrow him. They did concede a ceasefire, but only after he caved in following the missile episode against Syria. But Trump is not the only victim; many investors will lose as a stock market crash now is inevitable. It might yet be early to determine whether the Comey firing and the intelligence leak might lead to President Trump’s impeachment. But Wall Street doesn’t do guesswork well, and Trump has been dealt a blow that has weakened his authority. This will have a major impact on the markets. Simply put, the world’s major asset managers have built their investment strategies over recent months based on the Trump administration’s economic policies. Now these strategies are in question. The big question revolves around Trump’s fiscal stimulus plans. Should Trump fall (which would imply that he will have lost the backing of the Republicans in both Houses of Congress), on what beacon of optimism will the markets rely to continue the bullish course? There is no clear answer. The president’s fiscal plan was so ambitious that only a figure as charismatic as Trump could dare present it to Congress. What is it that frightens investors? A weakened Trump would lack the political clout to bring home the major tax reform, which has fueled the present rally. But, that’s not all. Trump risks becoming immobilized by the “Russiagate” investigation. The presidential plan to repeal Obamacare and to boost infrastructure investment will also suffer. Both were key points of this electoral platform. While most Republicans might not yet be ready to throw Trump under the proverbial bus, some are. If more Republicans decide not to come to the president’s aid, the market rally has no more legs on which to stand. Political gravity will catch up to the unrealistic market bubble, bursting it. 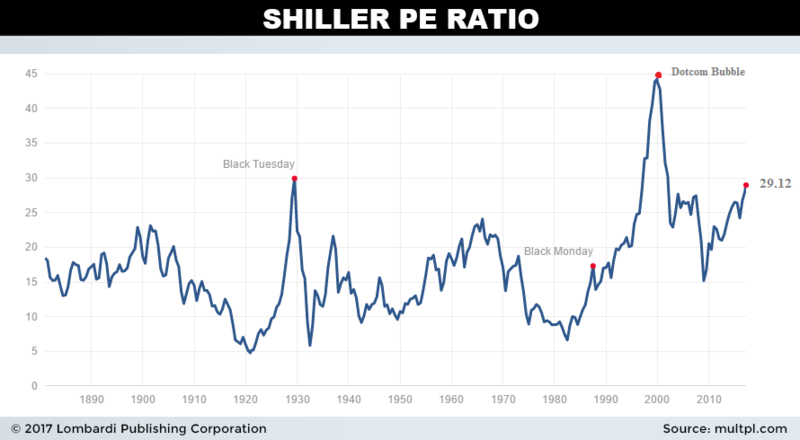 P/E Shiller ratios are already unsustainable. Thus, the political uncertainty surrounding Trump has doubtless given traders a reason to shift holdings to cash or gold. Not surprisingly, the uncertainty has already weakened the U.S. dollar. It has lost a few points to the euro. In less than a week, the dollar index, which measures the exchange rate against all major foreign currencies, has lost over two percent. To be sure, the dollar’s drop might be a point in Trump’s favor. The high dollar was always a threat to the competitiveness of American exports. When Trump won in November, investors sold bonds and bought shares. The opposite pattern could take hold in the next weeks. Some optimists, of course, will stay the bullish course. They will interpret the Dow Jones’ half-percentage-point crash on May 17 as a thunderstorm. But that’s the nature of uncertainty. A long and rocky road is ahead and there are reasonable doubts as to the extent to which the markets have already absorbed the hit, or whether they will go into a more prolonged spiral. Some media outlets are hinting that Trump’s impeachment is inevitable. But a closer look suggests this is a still a complicated issue with no simple answers. One way or the other, the cycle of investigations into the Trump administration will fuel hesitation. A quick resignation or impeachment would act like ripping off a “Band-Aid.” It would be painful but quick and to the point. Investors could take their losses and continue. But, as it stands now, the Russiagate situation will force Trump to lawyer up, contributing to another inquiry on a scale not seen since the Clinton-Monica Lewinsky investigation of the late 1990s. The impeachment of a president needs a conviction. In other words, before Trump or anyone else can be indicted, much less charged, the allegations against the president must be proven. Moreover, the process itself would require a majority of the House of Representatives to vote in favor of impeachment. There would have to be a trial in the Senate, and senators would have to have a two-thirds majority to condemn Trump. Therefore, impeachment is a lengthy procedure. For it to work against Trump , the president would need to lose his party’s support, as Republicans have the majority in both Houses. This seems difficult now. Trump might face obstruction of justice charges. Note, Comey’s firing might be the trigger. But Trump actually had the authority to dismiss Comey. The problem—and the obstruction of justice—would enter the picture if Congress can prove that Trump’s intentions were improper. The impropriety stems from allegations Trump fired Comey to stop the investigation into the alleged Russian involvement in the elections—to stop an unpleasant inquiry. This is the very same that cost President Richard Nixon the presidency in 1974—though he resigned before he could be impeached. Bill Clinton faced the same charge in 1998. Back to Trump and the markets, the chances of erratic Wall Street behavior increased after the surprise appointment of FBI director Robert Mueller, as special prosecutor. Mueller adds one more layer of complication and uncertainty on the Trump presidency and, therefore, on stock performance. But even if the Russiagate investigation should stop on lack of evidence, there’s no assurance that the U.S. economic outlook for 2017 suddenly changes. The financial markets are in trouble and there is the impression investors have decided that the White House is incompetent. This could burst the present stock market bubble. The so-called Trump rally will come—it seems to have already reached its demise—to a stop. The rising popularity of figures like Tesla Inc‘s (NASDAQ:TSLA) Elon Musk, or Facebook Inc’s (NASDAQ:FB) Mark Zuckerberg, or even Amazon.com, Inc.’s (NASDAQ:AMZN) Jeff Bezos suggests that they are the ones who have grabbed investors’ trust. That might be what has fueled the tech bubble. Trump’s political weakness will not allow the president to pursue deregulation and investment in infrastructure. In other words, the entire U.S. economic outlook has been compromised. Many voted for Trump in hopes of securing growth, cutting corporate tax, deregulation, repatriation of trillions of dollars of corporate profits, and a major investment program in infrastructure. So far, Trump has delivered little of this. He has proposed a corporate tax reduction from 35% to 15%. But will it now go through a hostile Congress? If history is an indication, a lame duck president might pursue a foreign war to deflect negative attention. In that sense, defense stocks remain a potential hedge against the volatility that will characterize the markets in the next months if not year. While Trump shall struggle to deploy his electoral agenda in Washington, the U.S. retail sector continues to sink. There is the phenomenon of competition from online shopping. But, that’s not all. There is a lack of confidence in the U.S. economy. Then there is the potential for the stock market crashing in Canada. For some reason, investors on Wall Street haven’t noticed. But sooner or later, the short sellers will act and catch everyone by surprise, pushing markets down on Wall Street and beyond. European markets, favored by the new positive figures published in Germany, with the GDP that expanded to the fastest-growing pace of the last twelve months in the first quarter, continue to grow, with little regard for the various problems affecting the world.